* My venues/performances are my livlihood. They are enriched by my local public television series “The Life & Times of Mrs. Thomas Andrews” that can be viewed & enjoyed through Youtube & Vimeo for out of area viewers. Subscribing to channel encouraged. “Special Episodes” are also featured occasionally between the regular series. Focusing on life in & around 1900 for the Victorian/Edwardian Lady and her family. * I am fully dressed in authentic Edwardian attire for all venues/performances. All garments I have hand restored without assistance. Some taking up to 8 months to restore. It takes me 3 hours to ready for each & every performance. I style my hair with hair switches, rats (pads) & pins of the era. Careful attention paid to properly & historically applying my makeup. Meticulously dressing absolutely authentic at each level including my period shoes or boots & stockings. A dresser is needed to complete my appearance. I corset trained for many, many years & now the corset is a regular staple in my daily life outside of my shows. Reproduction corsets & undergarments worn for continuous daily training & maintenance. * Titanic-Mrs. Thomas Andrews is based out of New England, U.S.A.
Massachusetts, Chicago Illinois, Florida, Connecticut, & New York. 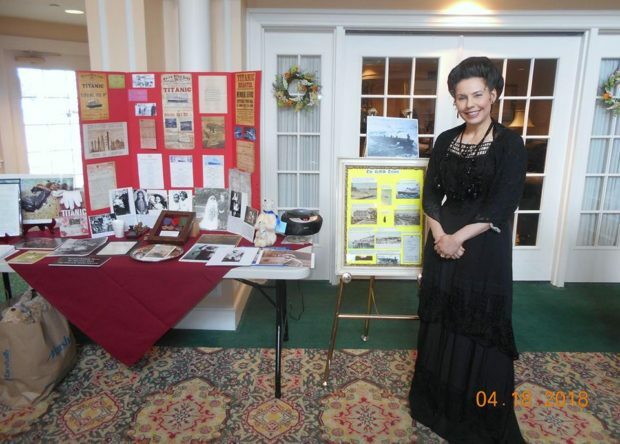 * Titanic-Mrs. Thomas Andrews is presented by Scotland Road Productions. Titanic-Mrs.Thomas Andrews fan page & group are available to join on Facebook. * Fees are determined upon distance /travel expense & time of year. Displays at time of venue are included at no extra charge. * Titanic-Mrs. Thomas Andrews makes every effort to work with our client’s budget. * Show times vary between 1 to 1.5 hrs. To be followed by a question & answer session. Audience participation is encouraged.